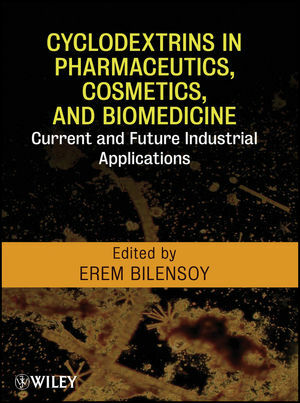 Erem Bilensoy, PhD, is a Professor of Pharmaceutical Technology at Hacettepe University in Turkey. Dr. Bilensoy has published more than forty articles in international peer-reviewed journals as well as six book chapters on cyclodextrins. Part I. Cyclodextrins: History, Properties, Applications, and Current Status. 1. Cyclodextrins and Their Inclusion Complexes (Dominique Duchêne). 2. Cyclodextrins as Potential Excipients in Pharmaceutical Formulations: Solubilizing and Stabilizing Effetcts (Alka Ahuja, Sanjula Baboota, Javed Ali, and Gulam Mustafa). 3. Cyclodextrins as Bioavailability Enhancers (Füsun Acartürk and Nevin Çelebi). 4. Cyclodextrins as Smart Excipients in Polymeric Drug Delivery Systems (Agnese Miro, Francesca Ungaro, and Fabriana Quaglia). 5. Recent Findings on Safety Profiles of Cyclodextrins, Cyclodextrin Conjugates, and Polypseudorotaxanes (Hidetoshi Arima, Keiichi Motoyama, and Tetsumi Irie). 6. Regulatory Status of Cyclodextrins in Pharmaceutical Products (A. Atilla Hincal, Hakan Eroglu, and Erem Bilensoy). 7. Cyclodextrins in the Cosmetic Field (Nilüfer Tarimci). 8. Cyclodextrin-Enhanced Drug Delivery Through Mucous Membranes (Phatsawee Jansook, Marcus E. Brewster, and Thorsteinn Loftsson). 9. Applications of Cyclodextrins for Skin Formulation and Delivery (Amélie Bochot and Géraldine Piel). 10. Oral Drug Delivery with Cyclodextrins (Francisco Veiga, Ana Rita Figueiras, and Amelia Vieira). Part II. Novel and Specialized Applications of Cyclodextrins. 11. Amphiphilic Cyclodextrins: Synthesis and Characterization (Florent Perret and Hélène Parrot-Lopez). 12. Gene Delivery with Cyclodextrins (Véronique Wintgens and Catherine Amiel). 13. Targeted Cyclodextrins (Stefano Salmaso and Fabio Sonvico). 14. Cyclodextrins and Biotechnological Applications (Amit Singh, Abhishek Kaler, Vachan Singh, Rachit Patil, and Uttam C. Banerjee). 15. Cyclodextrins and Cellular Interactions (Justin M. Dreyfuss and Steven B. Oppenheimer). 16. Cyclodextrins-Based Hydrogels (Carmen Alvarez-Lorenzo, Maria D. Moya-Ortega, Thorsteinn Loftsson, Angel Concheiro, and Juan J. Torres-Labandeira). 17. Cyclodextrin Nanosponges and Their Applications (Francesco Trotta). 18. Photodynamic Tumor Therapy with Cyclodextrin Nanoassemblies (Antonino Mazzaglia). 19. Sugammadex: A Cyclodextrin-Based Novel Formulation and Marketing Story (François Donati). 20. Cyclodextrins and Polymer Nanoparticles (Dominique Duchêne and Ruxandra Gref).